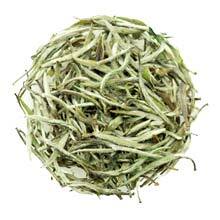 Shui Xian Bai Zhen is a very special and rare white tea. While most white teas are made using tea leaves from Da Bai (Great White) tree species from Fu Ding province, Shui Xian Bai Zhen is made using tea leaves from Shui Xian tree species grown in the deep mountain area of Jian Yang city in Fujian province. Although not as well-known as its cousins Bai Hao Yin Zhen (Silver Needle) and Bai Mu Dan (White Peony), Shui Xian Bai Zhen has been around for a long time. The Book of White Tea Research (Bai Cha Nian Jiu Zi Liao Hui Ji) written in 1963 mentioned that white teas made from Shui Xian tree species first appeared between 1911 to 1912. If this information is accurate, then Shui Xian Bai Zhen will be the earliest recorded white tea in history. Shui Xian Bai Zhen can be aged to improve the taste and strength of the infusion. Aged Shui Xian Bai Zhen of 3 years or more can last up to 10 infusions. The aroma of this tea is floral sweet, while the taste is clean, smooth and refreshing. There is also a light sweet aftertaste after each cup. Made only from tea buds and fully covered with silvery down which resembles the fur of a crane's pure white feather. When steeped, the tea buds stand upright like a forest of stalagmites in the cup, creating a beautiful visual presentation.